Pavement Management Plans: Free Resources for YOU! Here is a chance to go deeper into all things saving YOUR crumbling roads. Whether you are an Elected Official simply scanning Part One and handing this book off to your City or County Engineer, or whether you are a seasoned Pavement Manager with decades of experience, this simple book registration process will unlock hours of video, audio and written training material for you to further your knowledge on the topics that are discussed in this book. Because you took the initiative to purchase a copy of this book, you are entitled to several FREE gifts, including….. Simply register your book here to stay current and receive your free Bonus material www.thebookonbetterroads.com/register. Once your name and email address are in our system, we will send you a continuous stream of free BONUS content over the next several months delivered directly to your inbox. We promise to never SPAM you, while keeping you current on all the great things that are happening as we resurrect our economy and make better roads for all! 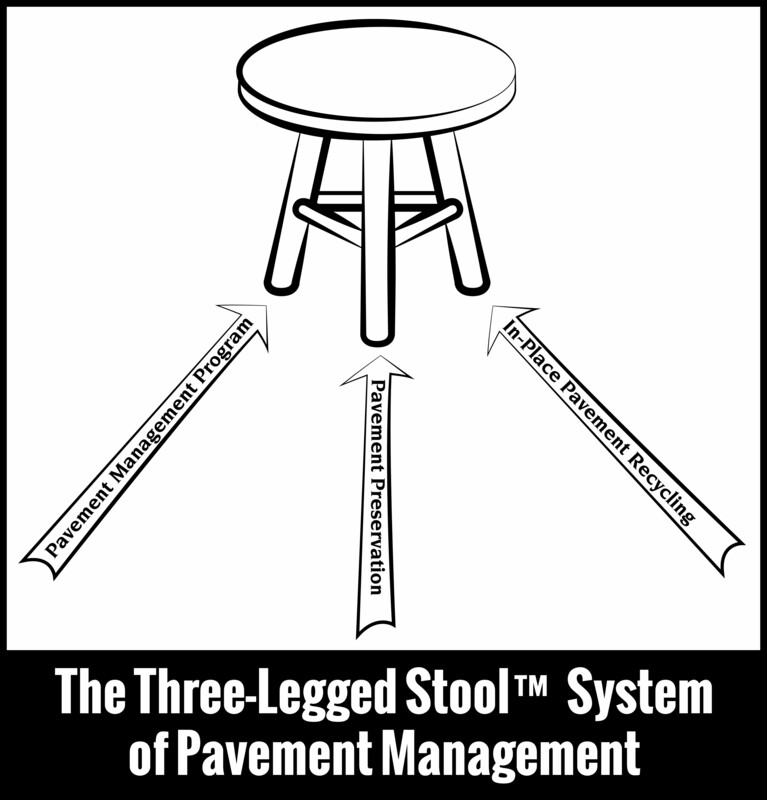 Throughout the book I will be referring to the Three-Legged Stool™ of Pavement Management. This is a system that I devised over the last decade to save local agencies millions of dollars by marrying a proactive pavement management program with eco–efficient in-place asphalt recycling and pavement preservation. Along the journey you will take reading this book there will be several references to many of the things I do as an entrepreneur. Understand that it is not my intent to baragge you with underhanded marketing tactics to sway you into hiring, joining, or doing anything you didn’t want to do. There are no secret NLP tactics in our videos or podcasts, and we will never put you into a hypnotic trance and sell you stuff that you didn’t ever want. That being said, I can say that had I not jumped behind the wheel of my RV and driven 83,000 miles at the time of this writing, I never would have had the perspective required to educate the masses. Even after 30 years of heavy civil construction, with two decades of that being spent teaching university and college level curriculum on this vary subject that makes up this book, I wouldn’t have had the courage to stand up and say what needs to be said. Even after spending several years as a Board Member on a very influential Industry Trade Association, and routinely dealing with high ranking FHWA (Federal Highway Administration) and State DOT folks, had it not been for the Driving America for Better Roads series of videos I don’t think I would have ever had the simple gumption to stand up for this great country, and say the things that need to be said. You see, even after traveling across this country several times over and teaching FHWA National Highway Institute curriculum, developing new curriculum, helping to write and rewrite the texts that go along with this curriculum, it wasn’t until I put myself behind that seat in the Better Roads Bus and forced myself to drive 1,000 miles a day, it wasn’t until I saw first hand the billions of dollars that are being pilfered away, that I really, actually GOT IT. We are watching our infrastructure crumble in this country (plug in your own country if you are reading this book abroad) for no apparent reason. I see first hand during my travels the stupidity of what we are doing, there I said it, and it feels good to get it out of my system. I was told a long time ago to never go to your boss with a problem without a solution. Well today as I write this book, I will say that the problem is that we are wasting billions of dollars on rehabilitating our 4 million miles of road like it is 1956, while some hold out state DOTs and trade associations insist on putting up walls around the local agencies, the city and county engineers and elected officials that rely on them and trust them for advice. That hang on their every word to direct them to do what is right for their local agency. Well, here it is, I am going to say it once and for all. A few states get it, as do many cities and counties. But as long as there are state DOT officials, FHWA officials, trade associations, and naysayers out there sabatodging the efforts of those that do get it, those wanting to be better stewards of their infrastructure, then I will continue to fight the fight. I will continue to drive 1,000 miles a day, until I see change. Until the day comes when every single road that I travel each day is a road that is somehow recycled in place, or better yet preserved from day one so it never falls in to a state of disrepair. And while I have already dedicated this book in the previous pages, here goes a big shout out to the naysayers, without you, I may have never had the fire in my gut to put pen to paper and finish this book. Beware the naysayers, because if your local agency is waiting to hear from your state DOT officials or trade association about cost effective and innovative ways to take care of your aging infrastructure, you may only hear of one or two method of how to do that. You may never hear about the entire tool box of cost effective methods to do so. And while there may never be enough pages in this single book to direct you to the right resources know that we have built an entire umbrella of ways for you to get more information as you go forward in your journey to become a better pavement manager or a more edcuated elected official. Again, I want to remain on the high road here and never want to appear to be bashing any person, state agency, or trade association. But, I also can’t be casper milktoast here or we simply will never see change. That is what 80,000 miles a year does for a person. You get to see the amazing success stories from the APM™ Accredited Pavement Managers, you get to see cities and counties all across the country implementing successful pavement management programs, and saving millions. You here stories of successful in-place pavement recycling like Kenny Horak from City of Richmond, VA here in Episode 4 of Better Roads Radio www.betterroadsradio.com talking about how he did 250,000 SY of hot in place asphalt recycling and loves the results. I could go on forever, and will present many more case studies in Part Two of the book. But think about this again if you will….. how can all of these techniques successfully work in some states and their respective cities, townships and counties, and yet in other states, state DOT officials, local contractors and often industry trade associations are adement about keeping these exact same cost saving treatments and contractors out? Here is what I have learned so far in my 30 years or so in the business of building and teaching others how to maintain better roads: In America, FHWA writes policies like MAP 21 our Transportation Bill. They write into MAP 21 about how we should use sustainability and preservation of our infrastructure. They even go as far as to say that local agencies and state DOT officials can hire firms and services providers to do sole source supply provided there is an inherent cost saving benefit and the treatments are congruent with MAP 21 and the objectives of the Transportation Bill. Here is a link to the memo from King Gee of FHWA http://www.preventpotholes.com/fhwa-policy/ and a direct link to the deeper details regarding the US DOT’s take on the subject here at the FHWA website http://www.fhwa.dot.gov/programadmin/contracts/011106qa.cfm . FHWA is there to make policy, but based on my interpretations from conversations I have had with them over my career in the industry, they can not DICTATE what State DOTs do with their funds. So herein lies the dilemma. This means that while some State DOTs are out there re recycling roads that they did 22 years ago, some State DOTs are doing everything in their power to KEEP THESE VARY TECHNIQUES OUT. Yes you heard it. Some State DOTs have an entire binder full of proven techniques that they share not only with their internal staff, they also encourage the cities and counties in their states to do the same cost effective and eco efficient treatments. And at this very time while this is going on, some state DOT officials haven’t changed or added anything new and improved, or eco efficient or cost saving to their specifications books for decades. You see, these states are not willing to budge, they think they are different than the rest of the country and the world. Again, how do I know this Blair you ask? Because I have spent 30 years in this industry, and put the miles on to back it up. I have traveled and taught, and walked the walk, and talked the talk. I am not saying this to be boastful or arrogant, simply to reassure you that any page that you read in this book, is simply meant to be a conduit of change for this country and the world. We don’t have to have crumbling roads. In the vision that I have, and what we teach as an army of pavement management RockStars across the nation, this is a win, win , win situation for everyone. Nobody suffers as a result of The Three Legged Stool™ System of Pavement Management. In fact, your local agency could be saving millions right now, but you may have to stop listening to the vary folks that you think you should be listening to for professional advice. Beware the naysayers. Beware the naysayers, for they are evil and they will be exposed in a short amount of time thanks to people like you that have dedicated the time to read this book. Again, I want to reiterate there are many pavement management professionals out there across the country that I have had the good fortune to spend time with, whether learning from them, teaching them, or working for them as their pavement manager. To those that are fighting the fight, and winning the battle I commend you. Ben has done an amazing job of putting all of the additional details about what I do on a daily basis to promote this movement of better roads in this country and the world. You can find most everything in this one single website www.drivingamericaforbetterroads.com . Once you have had the opportunity to read this book and register it at www.thebookonbetterroads.com/register you may want to drop back occasionally to see what is going on at the mothership, Driving America for Better Roads www.drivingamericaforbetteroads.com. While I have spent 30 years in this great industry, it really was the past year sitting behind that wheel in the Better Roads Bus, meeting all you great folks, learning, strategizing, and dreaming about how we could JOIN together and resurrect our flailing economy, with a simple plan, that did it for me. Here is just one example, take a look at what my friend and colleague Stevan Gorcester, Executive Director of Washington State Transportation Board has done with his pavement management challenges: www.tib.wa.gov/tibdashboard.